Picture from REI Web catalog. 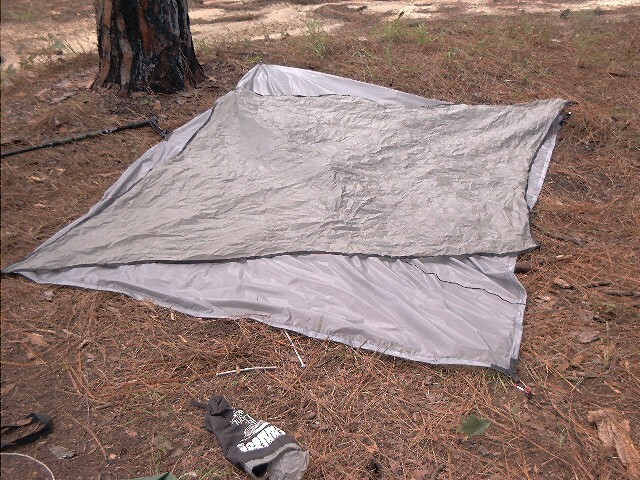 This Review also posted as part of a test by Backpack Gear Test. The question was asked and addressed a while back about setting up or taking down the hammock in the rain. I covered that in Tip #6 and Tip #7, both are still useful. 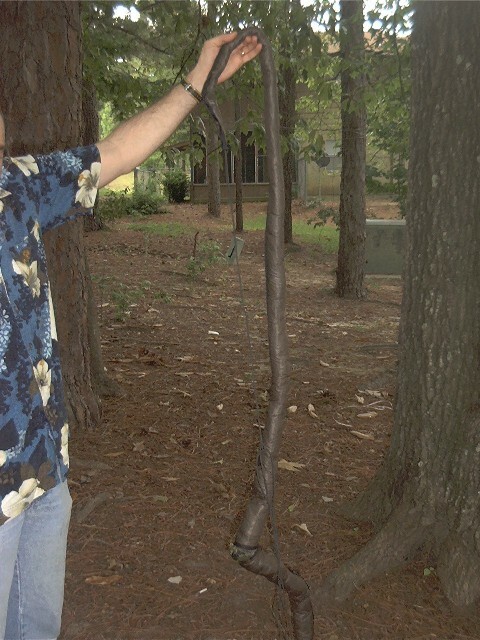 Unless you have a new accessory called the Snake Skin. 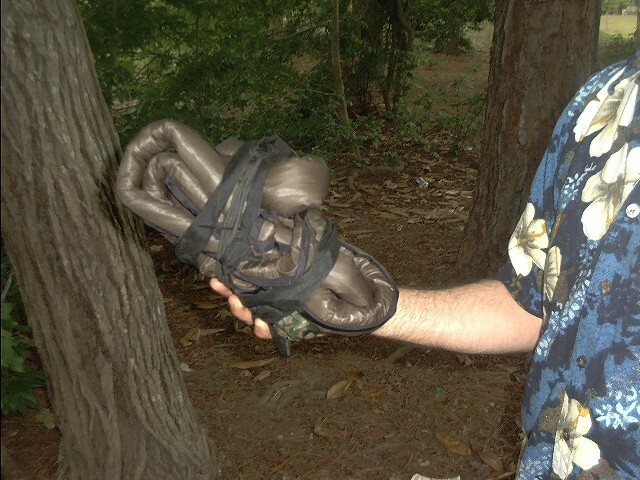 The Snake Skin is basically two sil-nylon sleeves that fit over your hammock cords and slide down over the hammock - replacing your stuff sack. 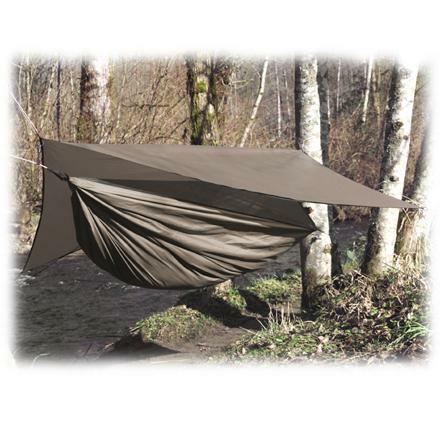 Since they are sil-nylon, they make a handy waterproof cover for the hammock, and since they stay on the hammock, they are very beneficial. The best part is you can't loose them and they are always where you need them. 1. 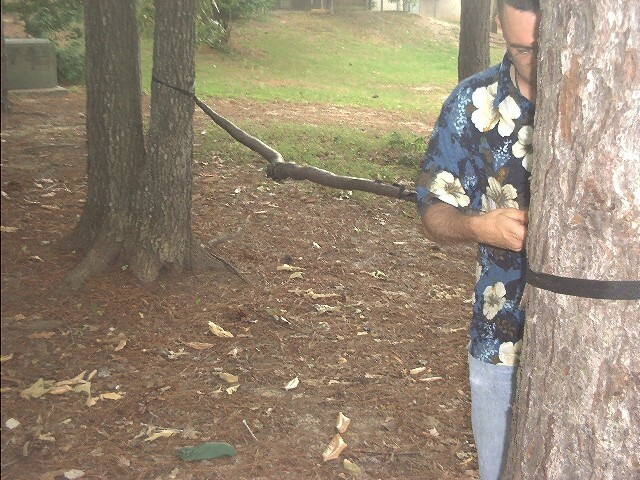 Select your trees and then start tying the hammock up, use loose slip knots until you center it. 2. 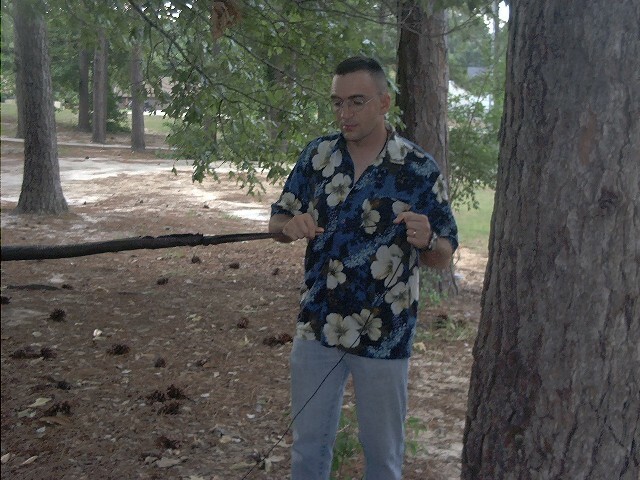 Tie the hammock up using figure eight knots and tighten. 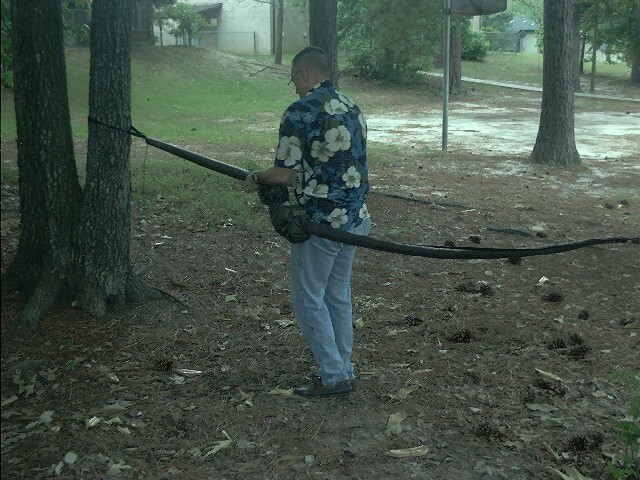 Ensure you have same length of rope on both ends. 3. 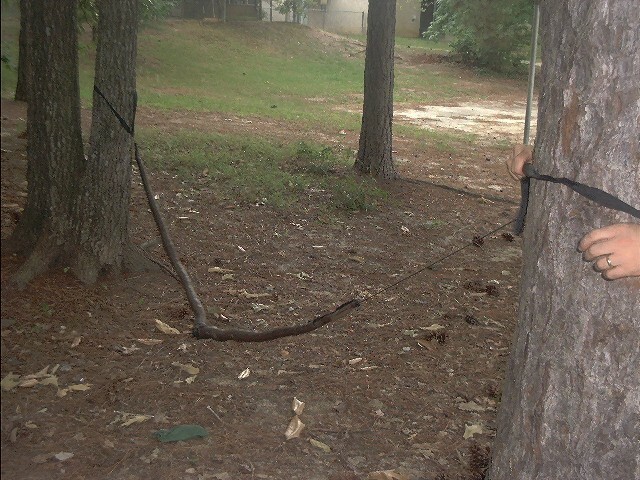 Push down on the center of the hammock with all your weight. As a general rule of thumb, it shouldn't sag below your waist. 4. 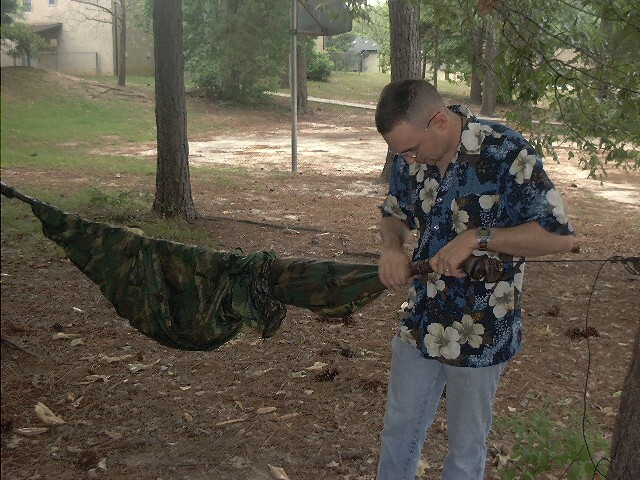 Pull the sleeves back to reveal the hammock, if you packed it right, only the fly will be exposed - keeping the hammock part dry. 5. Pull the other sleeve back until the hooks are exposed on the main line. A good idea is to mark which sleeve covers the foot end. 6. Unfurl the tarp. 7. 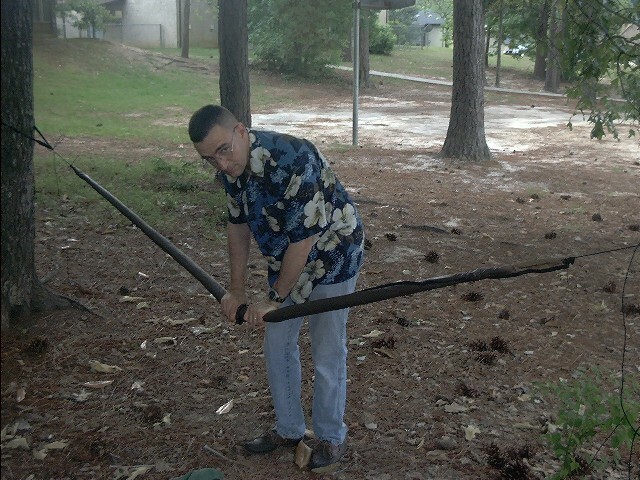 Tie out one side, leave some slack. 8. Tie out the other. 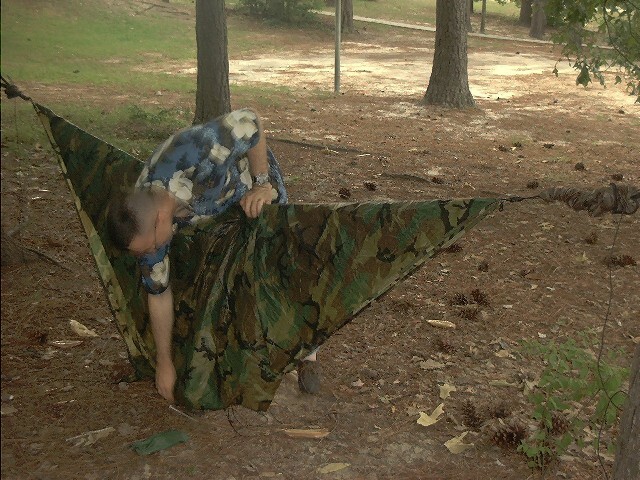 Center the tarp over the hammock and make it tight. 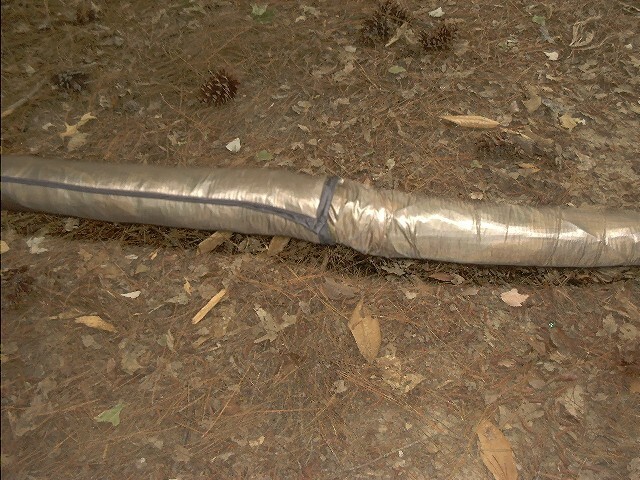 Then tighten the tarp on the main line. 9. The sleeve is pulled back and make sure only the outside is out, so the inside can stay dry if possible. 1. 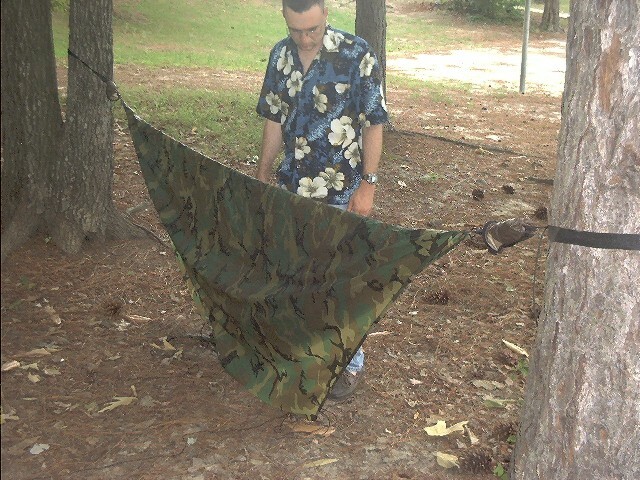 Pull out the stakes and let the tarp drape over the hammock. 2. 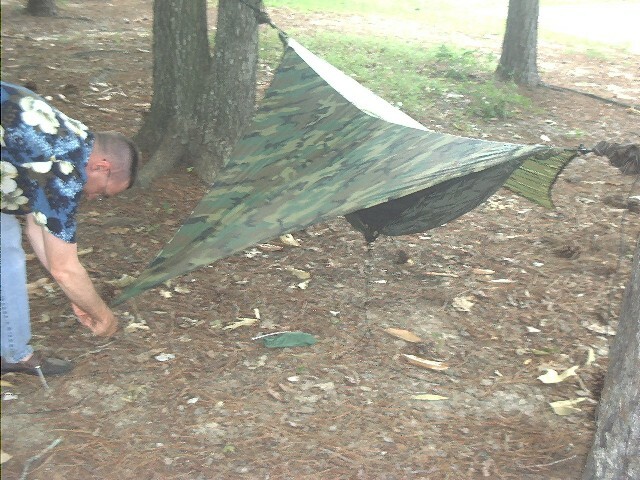 Wrap the corners of the tarp around the hammock. Once is enough. 3. 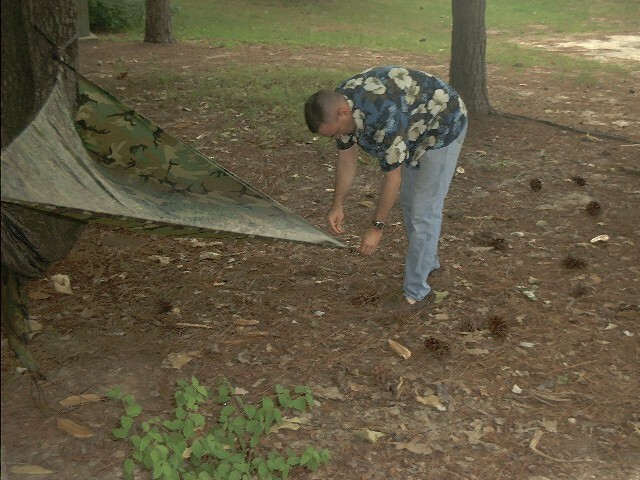 Tuck in the side ties for the hammock, then use wrap the tarp strings around to make it neat. 4. You should end up with an efficient little roll. 5. 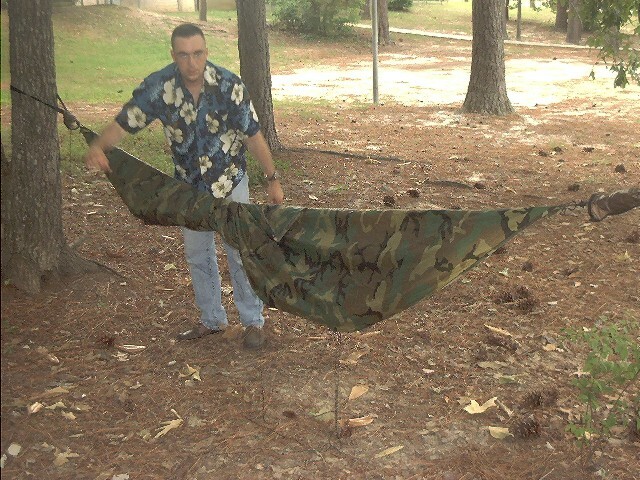 Now just pull the head sleeve back over the hammock. 6. 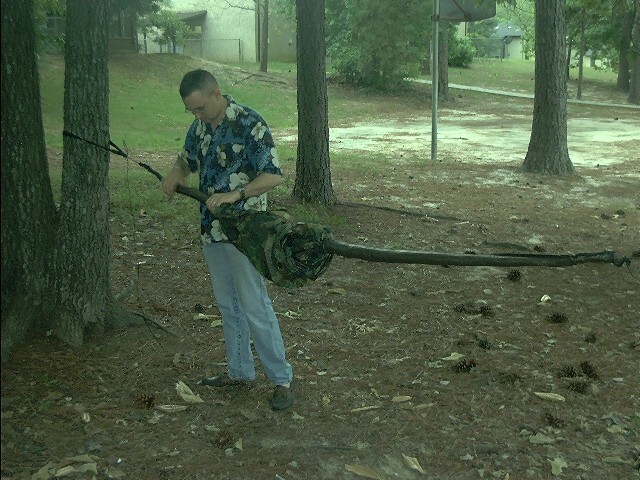 Pull the the other end over as well. 7. There should be a little overlap for the two skins. 8. 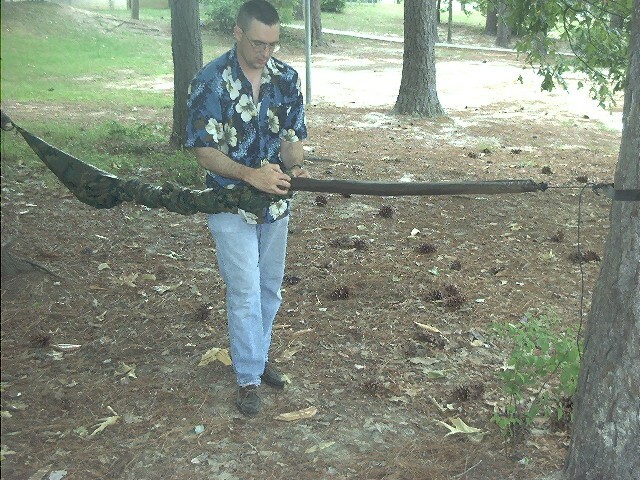 Now just take down the hammock. The sleeping part never hits the ground. 9. Wrap it in a nice ball to put in your pack. 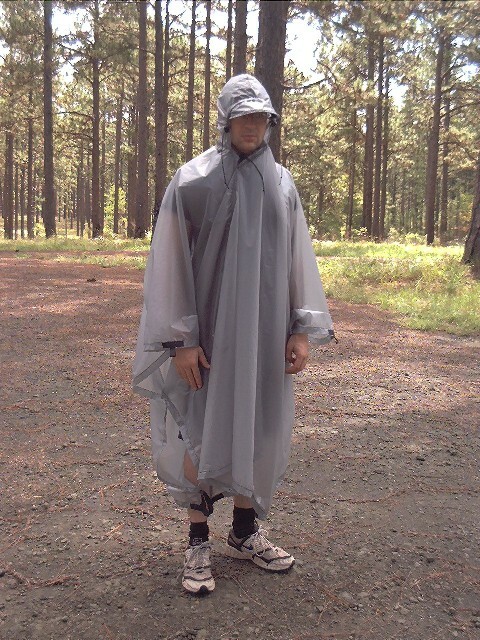 As a note to this: There is the option to replace your tarp with an ID Sil Poncho, or have something similar custom made. 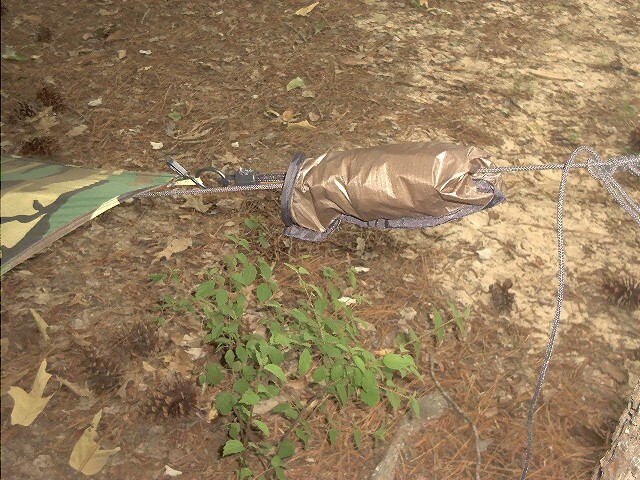 In that case, place the skin between the hammock and the string for the hook. 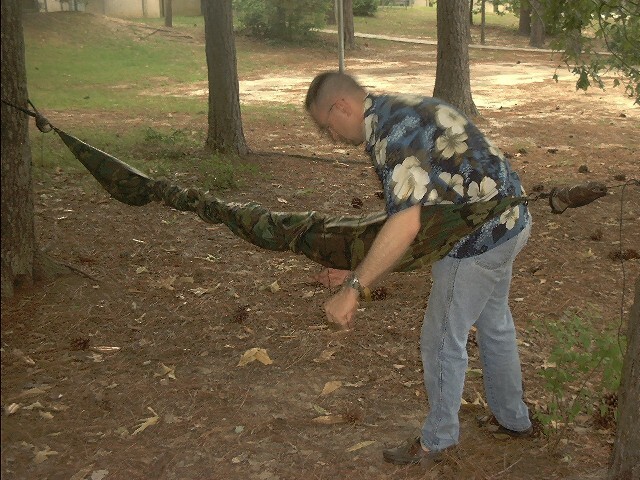 Then you can tie up the hammock while still in the skin, hook on the poncho and set it up, then slide the skin back for the hammock. If you think about the moisture the tarp could get inside the skin, this could actually be a better option. 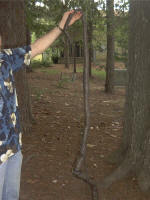 You may not find them listed on the Hennessy Hammock Web site yet, but just call and order them. They are being sold for $19.00 for the set. 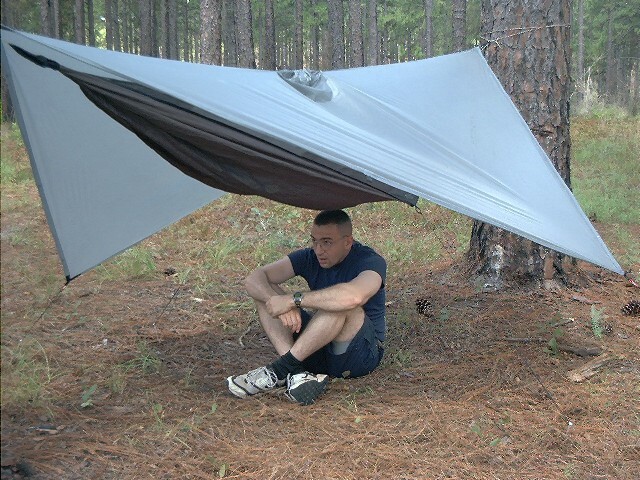 I based it off the A-Sym tarp and the ID Sil Poncho, but with a little of my own ideas from using Army ponchos for years as a tarp. 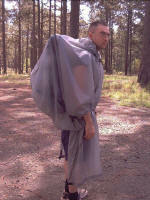 Original Hennessy Ultralight (not the A-Sym) tarp over my poncho. Using it a s a poncho. Using it as a poncho and a pack cover. 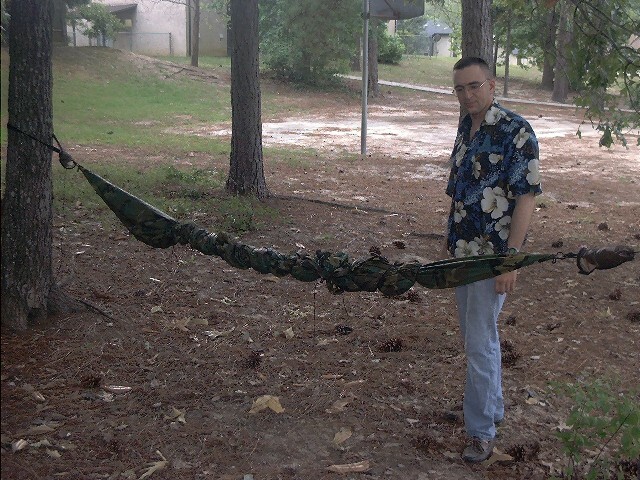 Using it as a tarp for the Hennessy Hammock. 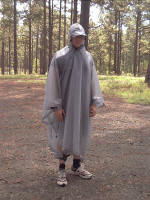 The poncho itself only weighed 9.4 ounces, 10.6 after seam sealing it. It cost me $100 because I needed extra material to make the diagonal seam. To make it work with the hammock, I bought 4 of these 0.2 ounce mini carabineers and put some light nylon string on two of them so I can hook and un-hook them based on my needs. 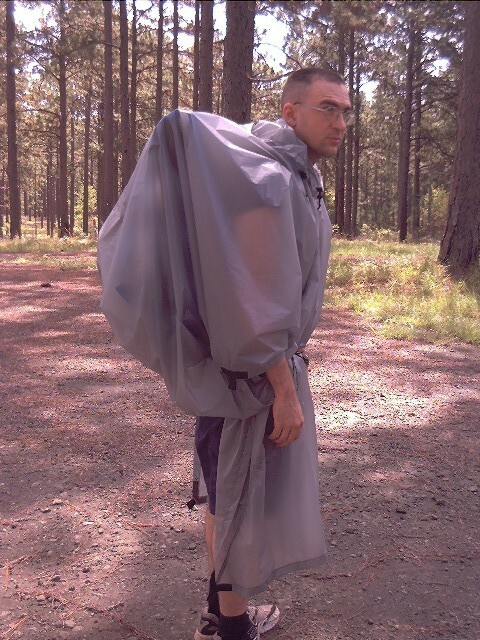 So, for 11.4 ounces I have a tarp, poncho, and pack cover. If your interested in once, contact Moonbow. I haven't had a chance to try it in the rain yet, but I will post the results here later.